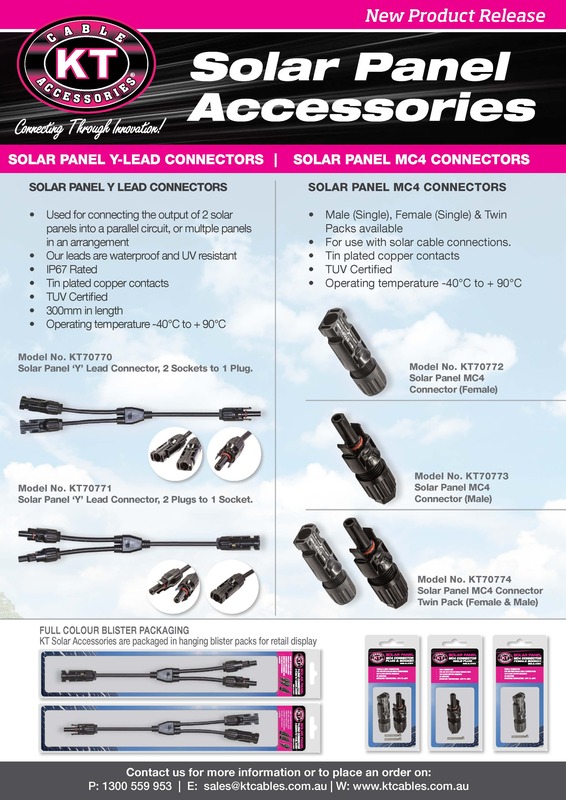 KT Solar Y-Lead Connectors are available in Male and Female Connections and are commonly used to connect other solar panels in ‘Parallel’. Y-Leads have many benefits, starting with the ‘Y’ Design. They feature 1 lead with a male or female MC4 Connector on the end. About half way through the lead, it splits into 2 leads which feature a connector on each end (which is usually 2 of the opposite to the other end. A Model No. KT70770 Y-Lead features 1 Male MC4 Connector, running to 2 female MC4 Connectors. A Model No. KT70771 – Y-Lead features 1 Female MC4 Connector, running to 2 Male MC4 Connectors. 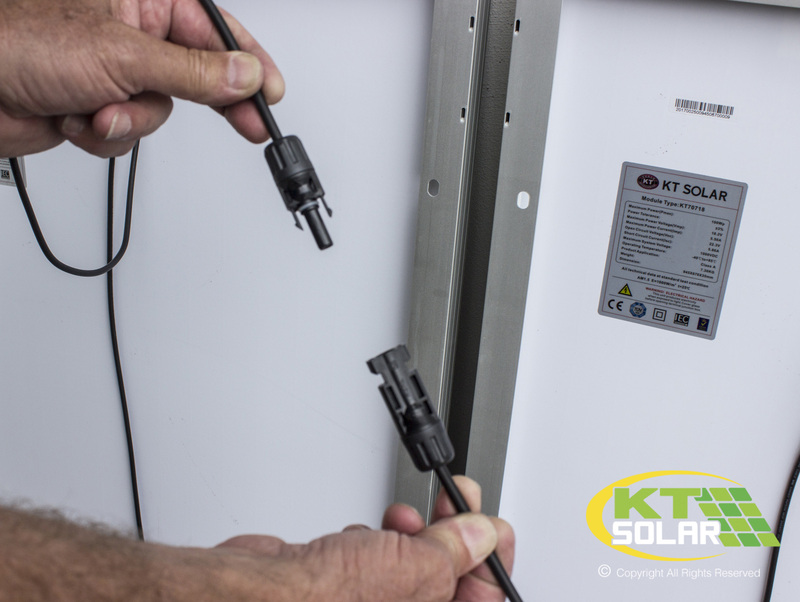 Another benefit of Y-Leads is that the connection is basically all done for you to make installation and changing your solar panel over, very simple! All that is required is to connect your Y-Lead to the ‘Fly Leads’ from your solar panels. As we have mentioned in the first paragraph, Y-Leads are ideal for connecting solar panels in Parallel. 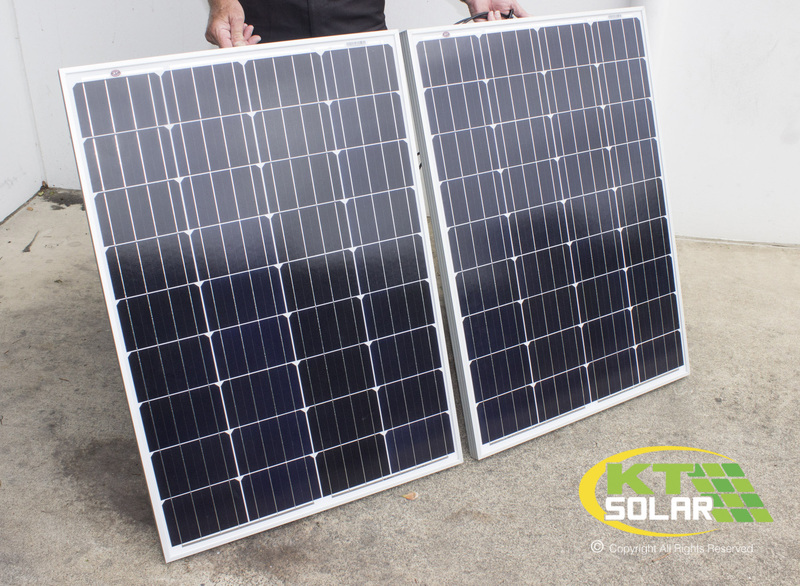 There are two main ways in which you can connect multiple panels for higher power output. These wiring configurations are known as Parallel & Series. Parallel wiring configuration doubles the Wattage and Amperage but keeps the voltage nominal at 12V. It is very advantageous in Auto/Marine applications particularly to use multiple panels. 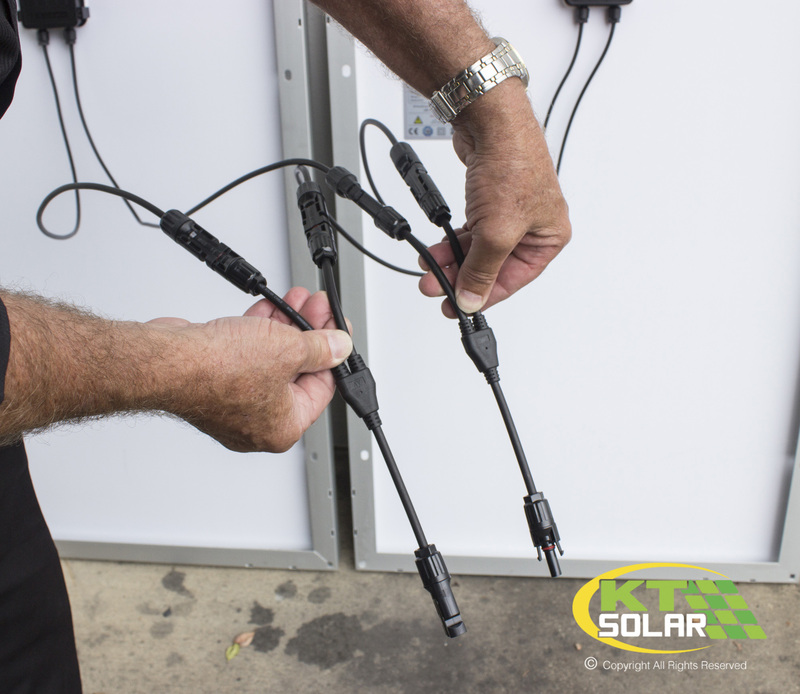 Parallel Is the most commonly used wiring configuration because when you put two panels together you double the amps when you put 3, you triple and on a large caravan motor home you can place 4 Solar panels and quadruple your amperage but maintain the voltage. This is an exceptionally very good way to do things. When wiring two panels in series, the Voltage and Wattage Double. (When using two panels of the same Voltage) and Amperage rating remains unchanged. Connecting Multiple Solar Panels in Parallel refers to 2 Solar Panels of the same Wattage (Imp) being connected Positive to Positive, Negative to Negative. Simply put, Parallel is the same as when you are trying to jump-start a car – positive to positive, negative to negative. That is a parallel connection. The nominal voltage remains at 12V. Connecting Multiple Solar Panels in Series refers to 2 Solar Panels of the same Wattage (Imp) being connected Negative to Positive, Negative to Positive. A great way to think about Series is the common household torch. The torch has up to 6 x 1.5V batteries all sitting on top of each other but it’s connected negative to positive, negative to positive all the way through then you end up with a load at 9V. (6 x 1.5V = 9V). Seeing as Y-Leads are designed for Parallel Connections, You will require 2 x Y-Leads. (1 x KT70770 & KT70771) to form a complete parallel solar connection. 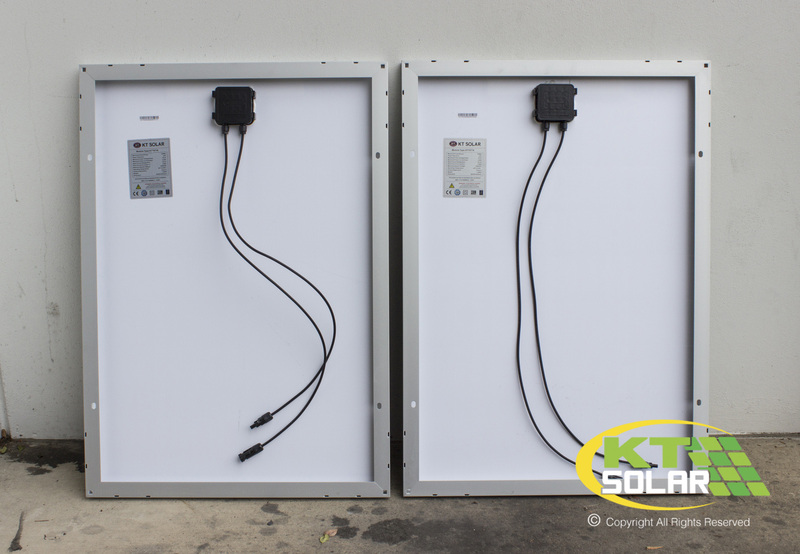 In this example, we will be connecting 2 x 100W KT Solar Panels in Parallel to create a Maximum Power (PMax) of 200Wp and a Maximum Power Current of 10.92A (Imp). Parallel wiring configuration doubles the Wattage and Amperage but keeps the voltage nominal at 12V. Here are the Specifications of each of the below panels. 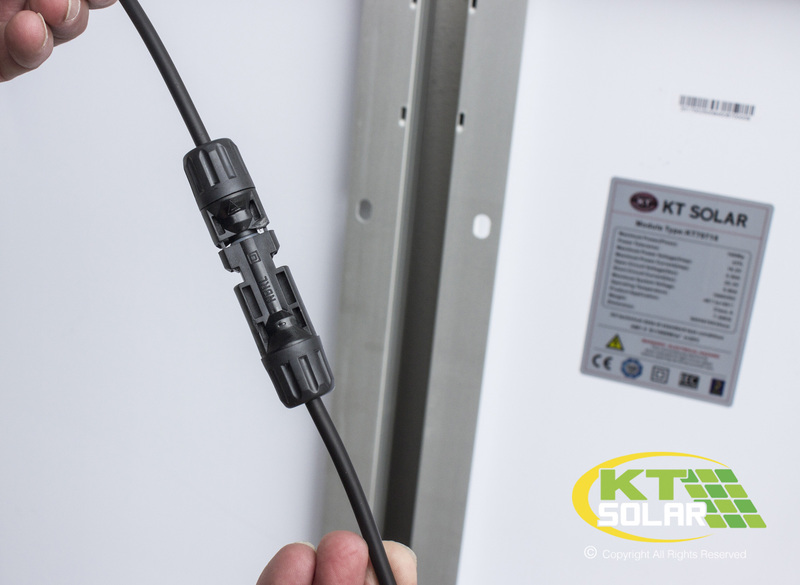 Note: KT Solar Panels are provided with leads and connectors already – depending on what size solar panel you have purchased, will depend on whether your panel features Fly Leads with MC4 Connectors terminated to the ends, or Alligator Clamps terminated to the ends. 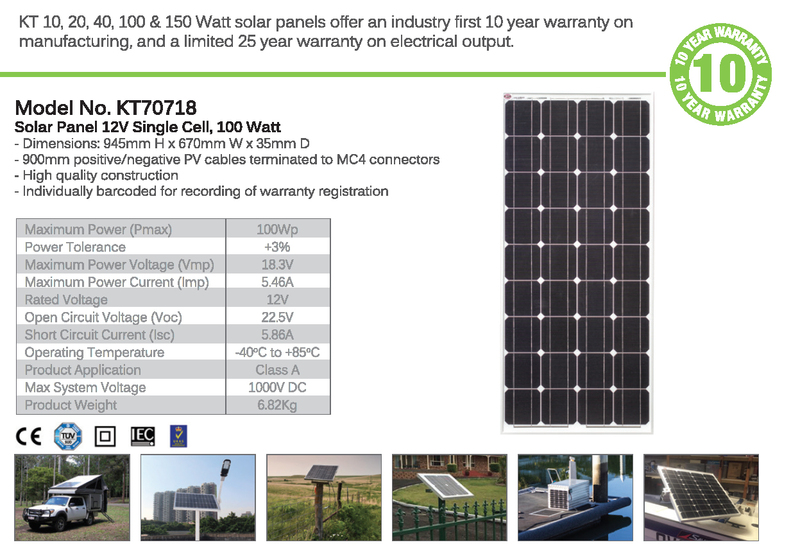 Generally Smaller Solar Panels eg; 5W, 10W, 20W & 40W will feature Alligator Clamps and larger Panels eg; 100W, 150W, 160W will feature MC4 Connectors. Y- Leads will only connect with MC4 Connectors. 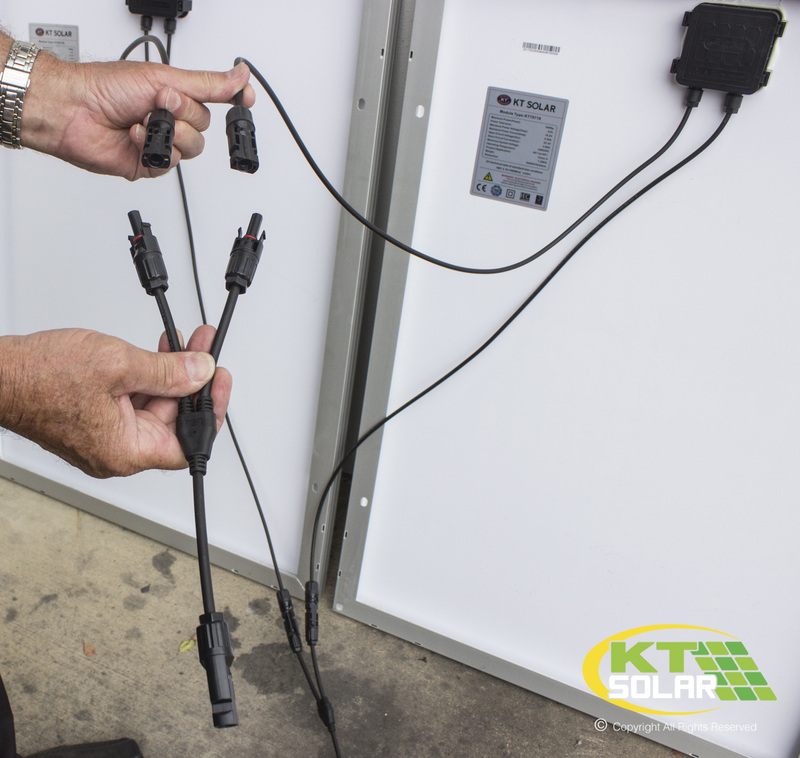 Follow our easy steps to learn how to install MC4 Connectors to your Solar Panel Leads here. 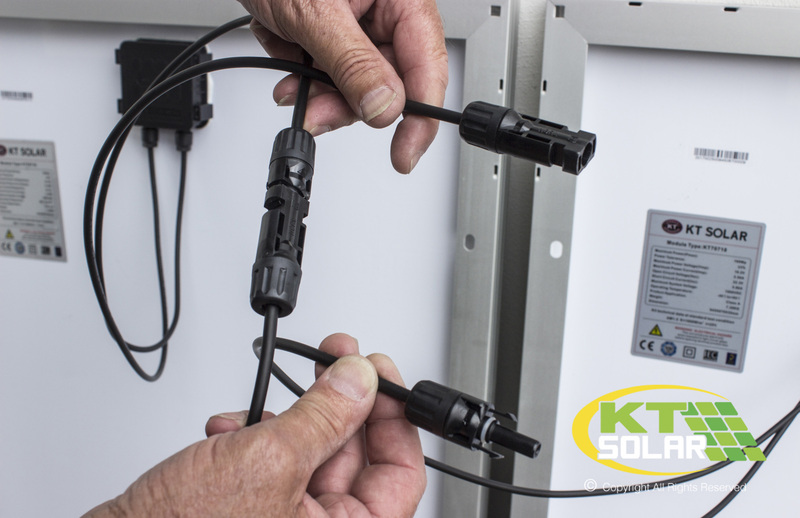 To create your ‘Parallel’ Connection, take the Positive Connections (Male) from your Solar Panels and connect these with the KT70770 Y-Lead (Female) Connections. Take the Negative Connection (Female) from your Solar Panel and connect this with the KT70771 Y-Lead (Male) Connections. So far, your connections should look like the below example. Simply connect your 2 Y-Leads together, using the male and female connections as per example below. If you are wanting a ‘Series’ connection, instead, simply connect the Positive Lead (+) on your Solar Panel to the Negative (-) on your Solar Panel, and the Negative ( – ) Lead to the Positive (+) on your Second Solar Panel. 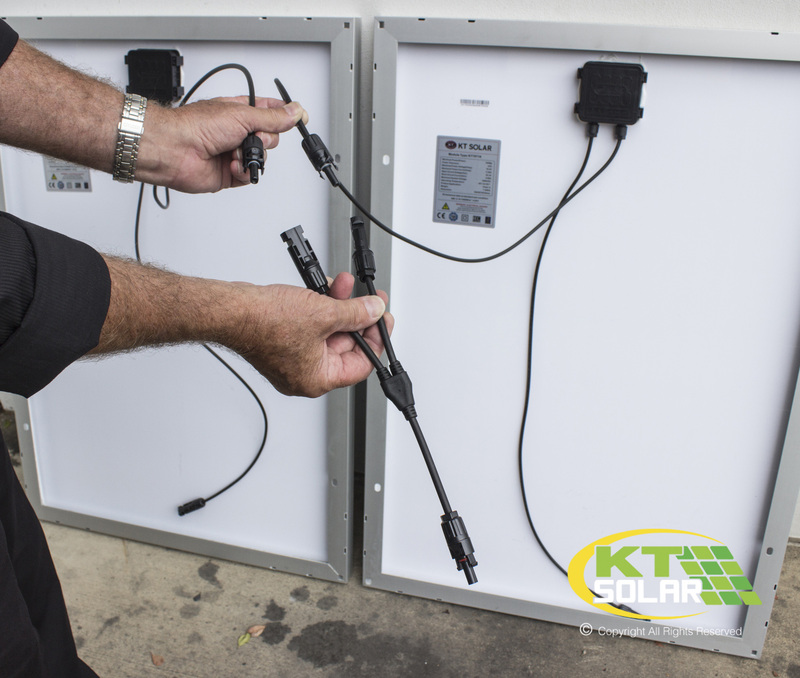 Should you have any questions about KT Solar Y-Lead Connections and ‘How to Install’ or require any further information, please contact our friendly sales team on 1300 559 953 or submit any inquiries through the below contact form. © Copyright KT Cable Accessories, All Rights Reserved. All Imagery within this Post has been photographed by KT Cable Accessories, For KT Cable Accessories. Should you wish to use these images, email marketing@ktcables.com.au to request permissions. Any Instructions mentioned in this Blog Post are only to be used as a guide. KT Cable Accessories accepts no responsibility for damage or injury as a result of following this guide.